Just as rising farm incomes place upward pressure on farmland values and cash rental rates, falling farm incomes place downward pressure on farmland values and cash rental rates. In August, the USDA released its annual update on farmland market conditions. Much attention focused on the slight drop in U.S. cropland values and unchanged pasture values. This week’s post takes a look at the changes in cash rental rates at the national, state, and county-level. In figure 1, the U.S. average cash rental rate for cropland is shown. 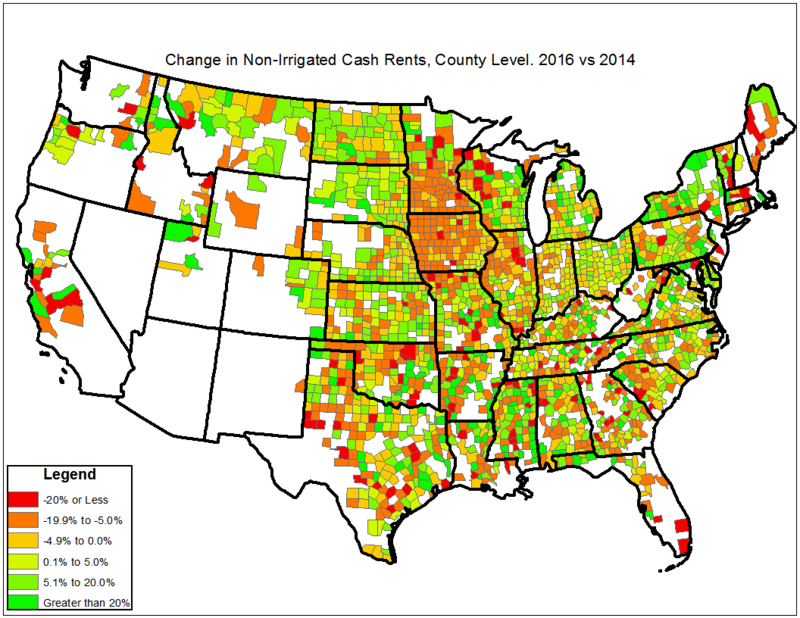 After a surge in rental rates that began in 2008, the national average for cropland cash rent fell 6%, to $136 per acre, in 2016. The only other decline in national cropland cash rental rates since 1998 was a 3% decline in 2007. Figure 1. Average U.S. Cash Rental Rate for Cropland, 1998-2016. Data Source: USDA NASS. While the national trend was for lower cropland rental rates, it’s important to keep in mind conditions often vary at the state and county levels. In figure 2 changes in the state average cropland rental rates are shown (2016 compared to 2015). Overall the changes were quite variable. In the Midwest, cash rents dropped the most in Minnesota and Iowa – more than 6% lower – while most of the Midwest and Great Plains were also lower. On the other hand, Michigan and Wisconsin actually reported higher cash rental rates in 2016. 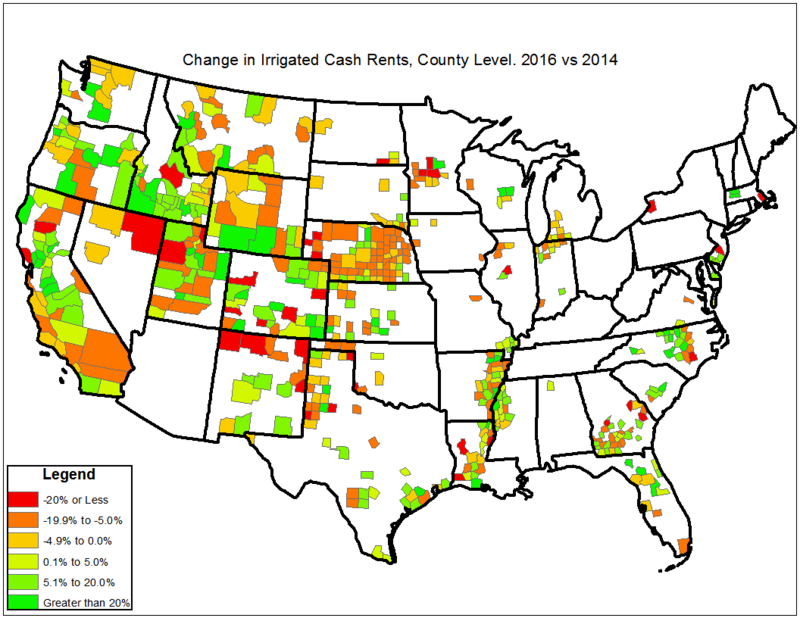 Outside of the Midwest, cash rental rates also contracted significantly in the West where drought conditions have lingered. Rents were also mostly lower in the Southeast. Figure 2. Percent Change in Cropland Cash Rental Rates at the State Level, 2016 vs 2015. Data Source: USDA NASS. Drilling even deeper, changes in non-irrigated cropland rental rates at the county-level are available and shown in figure 3. More specifically, figure 3 shows the percentage change in rental rates in 2016 compared to 2014 (county level data in 2015 were not collected by the USDA). Similar to the results in figure 2, rental values fell the most in Minnesota, Iowa, Northern Missouri, and Northern Illinois. Those interested in changes in irrigated rental rates can find the map here. Figure 3. Percent Change in Cropland Cash Rental Rates at the County Level, 2016 vs 2014. Data Source: USDA NASS. Similar to cropland, the average rental rate for pasture in the U.S. also fell in 2016. Pasture rental rates in 2016 declined 7% from the highs set in 2015. Rental rates for pasture have actually fallen several times since 1998: -7% in 2007, -2% in 2003, and -4% in 2000. Figure 4. 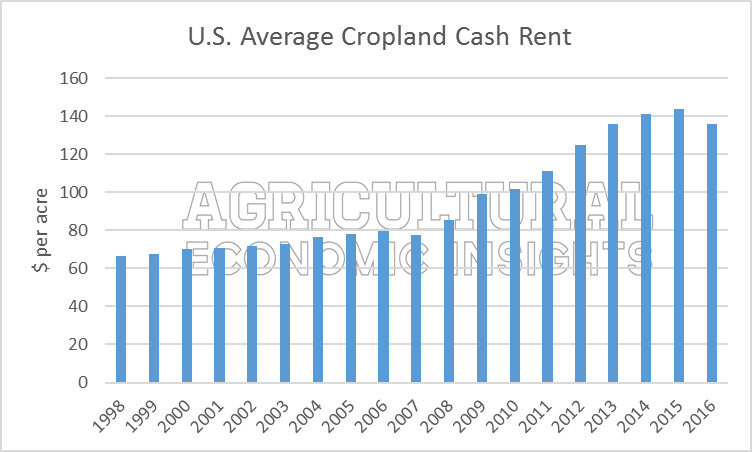 Average U.S. Cash Rental Rate for Cropland, 1998-2016. Data Source: USDA NASS. At the state-level, changes in the pasture rental rates also varied quit significantly (figure 5). In Nebraska and South Dakota, pasture rental rates were 16% and 11% lower, respectively. Those declines were much more severe than the 5% to 6% declines observed in the neighboring Great Plain states of North Dakota, Kansas, and Missouri. In the Eastern Corn Belt- Illinois, Iowa, Minnesota, Wisconsin- cash rental rates were higher. Pasture rental rates in Oklahoma, Arkansas, Louisiana, and Florida were sharply higher in 2016. Figure 5. 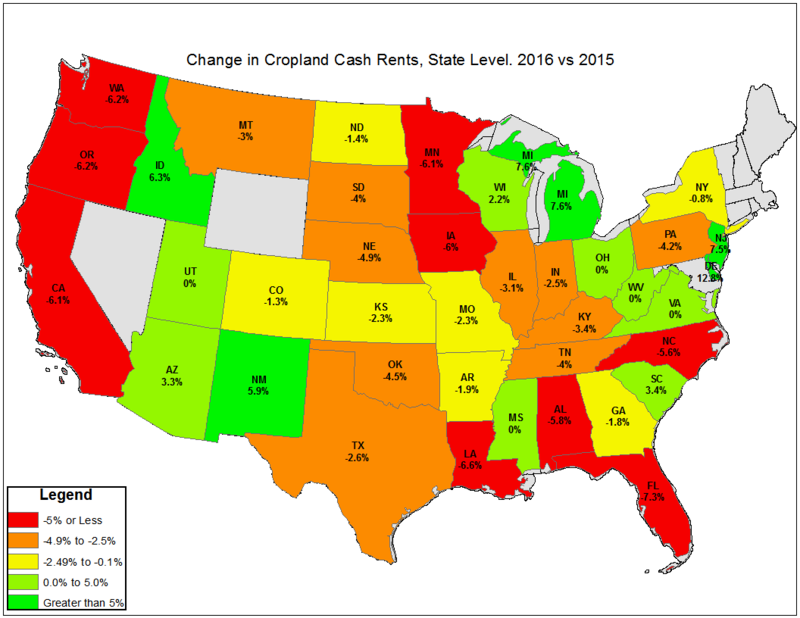 Percent Change in Cropland Cash Rental Rates at the State Level, 2016 vs 2015. Data Source: USDA NASS. While we have previously looked at changes in farmland values and cash rental rates during the boom-period, 2016 will be marked as the year cash rental rates began to decline at the national level. This is true for both crop and pasture. While cash rents have turned lower at the national level, conditions at the state and county levels vary significantly. Some states have felt significant downward pressure on cash rental rates while others have actually reported an increase in rates. Looking ahead, it will be important for producers and observers to keep in mind that the impacts of lower net farm income and the ag economy slowdown will vary across the county. While the national trends are important, it’s critical to also keep an eye on local conditions.